I just watched this BBC mini-series. Amazon Prime calls it one of their original productions, watch here. I am recommending it to those of you who follow events in the Middle East - others might find it too much of a niche offering. If you follow events in the region, it makes perfect sense. Although it deals with the British experience in Aden (‘Adan) in the mid-1960’s, it is directly applicable to the situation the United States finds itself in today in several areas. 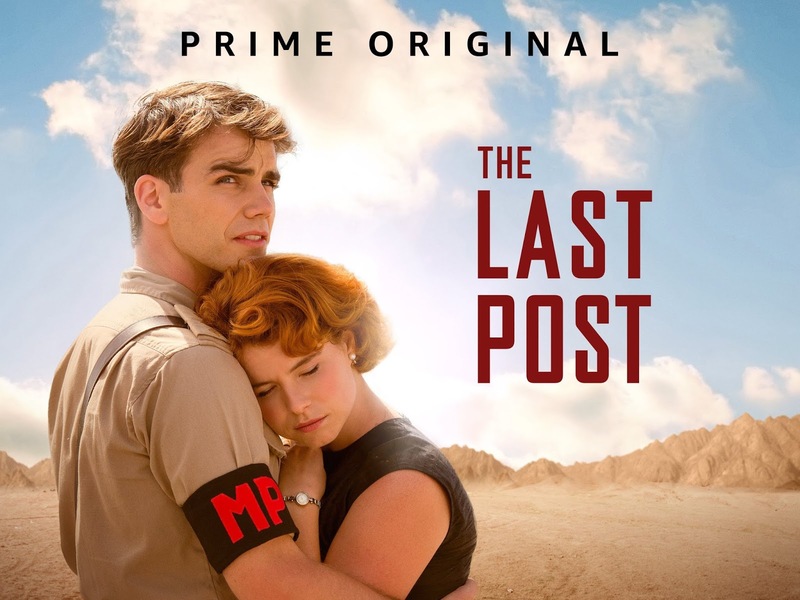 "The Last Post" follows a unit of the Royal Military Police and their families in Aden in 1965. Newlyweds Captain Joe Martin and his wife Honor arrive into the mix and must adapt to their new environment and their new lives together. Throughout the community, relationships are tested as the women struggle against what is expected of them as British Army wives and their own preferences. At work, the army unit fights a growing local insurgency and faces constant threats from hand grenades and snipers. That’s the theatrical story that carries the underlying theme – the end of empire, dealing with local nationalism and confronting “liberation” movements. It also deals with military relationships between officers (and their families), noncommissioned officers, and enlisted troops. It offers insight into the British Army, still one of the finest military forces in the world. The series did not fully explain the command relationships between the various military units, but, it is entertainment, not a documentary. An added predictable touch is meddling from an American journalist. On 30 November 1967, British forces withdrew and the independent People's Republic of South Yemen was proclaimed. It lasted until 1990 when South Yemen and North Yemen (Yemen Arab Republic) merged to form the Republic of Yemen. We’ve seen how that has worked out…. I want to give a shout out to the performances by Stephen Campbell Moore as Lieutenant Ed Laithwaite (I see some of me in his character), and Jessica Raine and Essie Davis for, well, being Jessica Raine and Essie Davis. With his arrival at Damascus International Airport today, Sudan's President Omar al-Bashir ('Umar al-Bashir - عمر حسن أحمد البشير - becomes the first Arab leader to visit Syria since the outbreak of the civil war in March 2011. 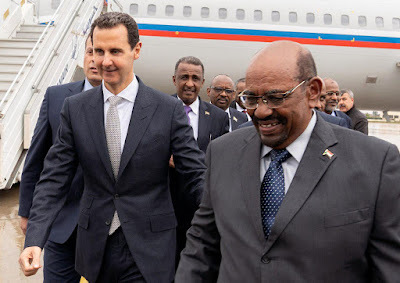 It is interesting that al-Bashir is the first Arab leader to visit - the Sudanese president is under indictment by the International Criminal Court (ICC); warrants have been issued for his arrest. The charges include genocide, crimes against humanity, and war crimes in Darfur. The charges are opposed by the African Union, the League of Arab States, the Non-Aligned Movement, and the governments of Russia and China. The irony of the visit by an indicted war criminal was not lost on some observers. Hillel Neuer, Executive Director of United Nations Watch quipped, "Always nice when a president wanted for genocide visits with a president committing genocide. Sudan sits on the UN committee overseeing human rights [nongovernmental organizations]; Syria holds leadership position on UN decolonization committee that fights 'subjugation of peoples.'" I draw your attention to the photograph (above) of the two presidents at the airport. 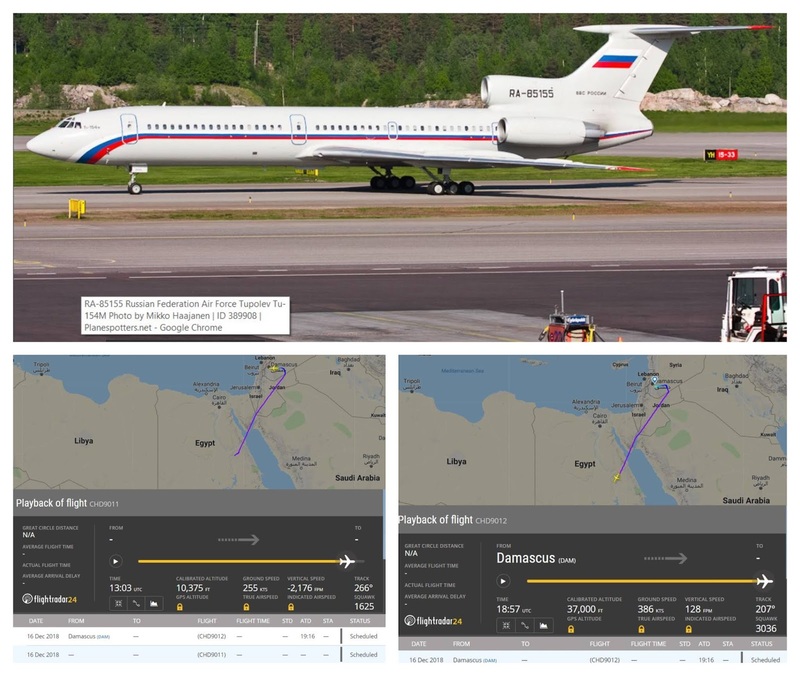 Note the color pattern on the jet used to transport al-Bashir from Khartoum to Damascus - it is the official livery of the BBC России (Russian Air Force), as noted on the tail of the aircraft. 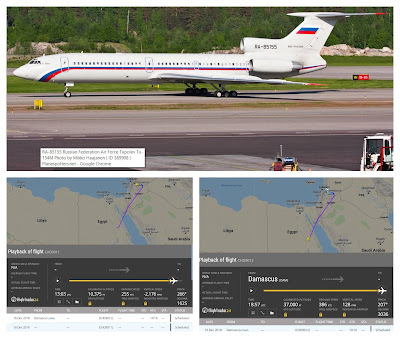 The Russians dispatched this TU-154M (RA-85155) VIP transport aircraft from Moscow to Khartoum (via the Russian air base at Humaymim, south of the Syrian port city of Latakia) to pick up al-Bashir, fly him to Damascus, wait for him to have his meetings with Syrian officials, including President Bashar al-Asad, then return him to Khartoum. This fits in with Russian President Vladimir Putin's attempts to increase Russian influence in the Middle East and Africa. Putin and al-Bashir have met on at least two occasions in the last year to discuss continued and increased cooperation. Russia is the major supplier of arms to the Khartoum government. On both of those occasions, like today, Putin sent a Russian Air Force jet to ensure al-Bashir's safety while traveling out of Sudan, keeping him out of reach of the ICC. The visit of an indicted war criminal does raise the question: Will Bashar al-Asad be held accountable for his war crimes? On a lighter note, let's not feel sorry for the Russian pilots and crew tasked with this long VIP transportation mission. The weather in Moscow today was 5 degrees Fahrenheit and snowing. Damascus was party cloudy and 60 degrees, while Khartoum was sunny and 90 degrees. The above is a screen capture of an article I wrote and posted on this website in April 2017, titled "Turkey and the fight against ISIS - whose side are you on?" Not much has seemed to change with Turkey, our supposed NATO ally - and member of the coalition formed to defeat the Islamic State in Iraq and Syria (ISIS). Turkey's unhelpful and unnecessary actions in northern Syria continue unabated. In an unnecessary and unhelpful turn of events, a series of armed confrontations has broken out in several locations along the Syrian-Turkish border. The combatants, unfortunately, are both U.S. allies. Turkish forces have mounted a series of artillery attacks and air strikes on a variety of Kurdish targets along virtually the entire Syrian-Turkish border, claiming that they are attacking members of the outlawed and designated terrorist organization Kurdistan Workers' Party, known more commonly by its Kurdish initials PKK. The problem - most of the targets are not PKK targets, they are actually elements of the Syrian Kurdish People's Protection Units, more commonly called the YPG. The YPG is an integral part of a U.S.-backed force, the Syrian Democratic Forces (SDF). The SDF was created, trained and equipped to combat the Islamic State in Iraq and Syria (ISIS). They are the "boots on the ground" support by coalition air power, artillery, special forces, and logistics. In recent days, Turkish President Recep Tayyip Erdoğan has announced that Turkish forces are about to begin an operation in northern Syria east of the Euphrates to eliminate elements of the Syrian Kurdish People's Protection Units, known by the Kurdish abbreviation YPG, located along the Turkish border. Erdoğan used words that indicate the operation will consist mainly of artillery, rocket and air strikes, rather than a ground incursion. He also referred to the YPG as nothing more than an extension of the Turkish Kurdish separatist group Kurdistan Workers Party, known by its Kurdish initials PKK. The PKK has been designated by the UN, U.S., and NATO as a terrorist organization. The YPG is the Kurdish element of the U.S.-backed Syrian Democratic Forces (SDF, or QSD in some media). Although there are also Arab, Assyrian, and Turkmen fighters in the SDF, the primary fighters are the Syrian Kurds. They are relentless, and arguably the most effective ground units in the fight against ISIS. Unfortunately, the Turkish president is not that concerned with ISIS, he would rather conduct operations against American-supported forces. Unhelpful and unnecessary - I keep using those words, because that is exactly what it is. 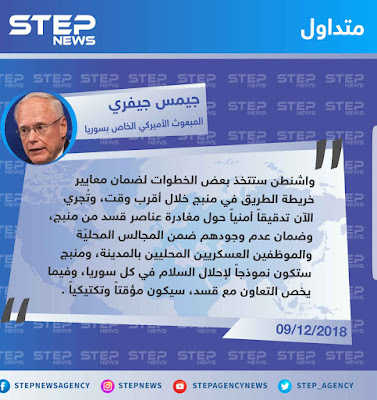 To complicate things, the U.S. Special Representative for Syria Engagement Ambassador James Jeffrey said inter alia that American support to the Syrian Democratic Forces (SDF), the mainly Syrian Kurdish force acting as the U.S.-lead anti-ISIS coalition's boots on the ground, is "temporary and tactical." See my article, American envoy: US Support to Syrian Kurds is "temporary". It was music to Erdoğan's ears. Of course, the United States is attempting to reach an agreement with the Turks to not take the pressure off ISIS, and more importantly, begin military strikes in areas in which there may be American troops working with the SDF. There are at least 2000 U.S. forces on the ground in Syria - I suspect the number is higher, but it is hard to get specific numbers from the Pentagon. Here is the Pentagon's response to the Turkish threat. Department of Defense spokesman: "Unilateral military action into northeast Syria by any party, particularly as U.S. personnel may be present or in the vicinity, is of grave concern. We would find any such actions unacceptable." If you want to be a NATO ally, you need to act like a NATO ally. You need to be part of the solution, not part of the problem. Fighting ISIS - you are, after all, a member of the anti-ISIS coalition - is the main focus. Eliminating the remaining pocket in Syria along the Euphrates River near the Iraqi border is the priority, not your perceived and frankly, unwarranted, attempts to force the Syrian Kurds away from the border between you and Syria. Here's what is going to happen if you continue down this reckless path. Once you start attacking SDF/YPG elements near the border, the YPG elements currently taking the fight to ISIS in the city of Hajin - which is about to fall after months of bloody fighting - will stop operations against ISIS and redeploy to the border area to defend their homes and families. This should come as no surprise to you - it happened in April 2017 when you did the same thing. In essence, what you are planning not only potentially puts American, French, and British troops on the ground in Syria at risk, it aids and abets ISIS by relieving the pressure on them in the Dayr al-Zawr area. They terror group may be able to regroup and hold or even retake all of Hajin. It again begs the question - whose side are you on? American envoy: US Support to Syrian Kurds is "temporary"
In a recent press conference after a Turkish-U.S. working group meeting on Syria in Ankara, U.S. Special Representative for Syria Engagement James Jeffrey said the Manbij roadmap requires a series of additional steps, and that American support to the Syrian Democratic Forces (SDF), the mainly Syrian Kurdish force acting as the U.S.-lead anti-ISIS coalition's boots on the ground, is "temporary and tactical." I understand that the ambassador was speaking in Turkey to a group of reporters composed mainly of Turkish journalists, but this either borders on "tell 'em what they want to hear" or is a slap in the face of the Syrians Kurds who have proven to be among the most effective forces fighting the Islamic State in Iraq and Syria (ISIS), making a much more significant contribution than the Turks the ambassador appears to be trying to appease. I have made no secret about my disappointment in the actions of our nominal NATO ally Turkey when it comes to the fight against ISIS. There are analysts who believe that Turkey at best turned a blind eye to the undeniable virtually unabated flow across the border with Syria of thousands of Middle Eastern, North African, and European believers that became ISIS fighters. Others are not so kind, accusing Turkish President Recep Tayyip Erdoğan of supporting the terrorist group in return for a tacit agreement not to attack Turkish interests. I have no doubts about the former, but remain hopefully unsure of the latter. Washington will soon take some additional steps to guarantee the implementation of the roadmap for Manbij, which will ensure the removal of SDF personnel from Manbij, including their presence on the local council, and as local military officials in the city. Manbij will become the model for peaceful solutions throughout Syria. Regarding [our] cooperation with the SDF, it will be temporary and tactical. For those not familiar with Manbij, some context based on my assessment of the continuing unhelpful and unnecessary actions by the Turks since Erdoğan ordered Turkish troops to move into northern Syria in August 2016, ostensibly to fight ISIS. While they did take the fight to ISIS, the Turks also began a series of engagements with the newly formed SDF, comprised mainly of Kurdish fighters from the People's Protection Units, or YPG in Kurdish. The Turks believe that the YPG is nothing more than a Syria-based extension of the outlawed Turkish-based Kurdish Workers' Party, known more commonly by its Kurdish initials PKK. The United States, NATO and the European Union have designated the PKK a terrorist organization, possibly in deference to Turkey's status as a NATO member. The operation was technically a success - the Turks and their Free Syrian Army allies did clear the area northeast of Aleppo of ISIS, but they also started a long and deadly battle against the Syrian Kurds. We all understand that the Turks have an ongoing armed confrontation in Turkey against the PKK. Those same Turks seem to have forgotten that the focus of the anti-ISIS coalition - the fighting in Iraq and Syria - is to eliminate ISIS, not the Kurds. Perhaps they did not forget - some will argue that the main focus of the operation was to open a front against the YPG, the Kurdish contingent of the SDF. The map shows the situation in 2017. Erdoğan publicly claimed that Operation Euphrates Shield was the precursor to the eventual coalition assault on ISIS's self-proclaimed capital in the Syrian city of al-Raqqah, an assault that he said must be led by Turkish troops. This claim was ludicrous - since his forces had begun military operations against the SDF, arguably the most effective ground units in the fight against ISIS - the Kurds were not going to allow Turkish forces to traverse over 100 miles of territory under their control, territory they had taken at great cost from ISIS. In his typical petulant style, Erdoğan ordered a series of border attacks along the length of the Syrian-Turkish border. Again, more unhelpful distractions from a nominal NATO ally. For a more detailed analysis of Operation Euphrates Shield, see my article, Turkey and the fight against ISIS - whose side are you on? Turkish forces eventually fought their way to the city of Manbij - not by taking it from ISIS, but from the allied SDF. It was only the direct intervention of American special operations units and Russian military police that the inter-coalition fighting was halted. It was a necessary step to refocus the fight on ISIS; many SDF units stopped operations against ISIS and returned to the Manbij are to resist the Turks, again, a distraction no one needed. Manbij remains on the edge of the Turkish and SDF lines. The United States has had to divert time and resources to assuage the Turks' anger at being marginalized in a pocket and basically taken out of the fight against ISIS. The Manbij "roadmap" is an attempt to give the Turks a voice as to what happens in northern Syria. The two countries now run joint patrols outside the city. It is useless and serves no purpose but to allow the Turks to believe they are part of the coalition on the ground in Syria. The U.S.-led coalition perpetuates this myth. Here is a tweet from Combined Task Force Operation Inherent Resolve (CJTFOIR), and my response. Their use of the hashtag #DefeatIsis is insulting to those actually in the fight. Back to Ambassador Jeffrey's statement. It was the last sentence that got my attention and raised my concerns. He said that our cooperation with the SDF will be "temporary and tactical." These are words the Turks, undoubtedly the intended audience, wanted to hear. Unfortunately, this is a zero-sum game. If you side with the Turks about the future of northern Syria, you do so at the expense of the Kurds. The Kurds have been, if not the best ally in northern Syria in the fight against ISIS, then among the top contenders. It has been the Kurdish-majority SDF that has taken the most casualties in the fighting on the ground. They are dedicated, courageous, and relentless fighters. The ambassador's words must have cut deep. Here is what the Turks heard: When this anti-ISIS fight is over, we are going to repair the current rift between Washington and Ankara - the NATO alliance is critical to both of us, and despite what the Syrian Kurds have done for us in the fight against ISIS, you are the more important ally. In the end, you will have most of what you want in northern Syria. 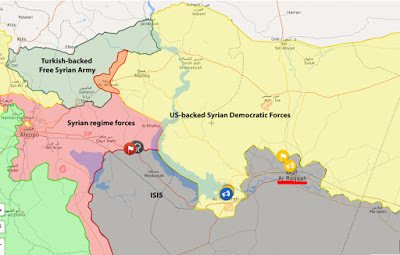 Just wait a while longer while we clean up the remaining ISIS pocket in the Euphrates Valley, then you can deal with the Kurds with minimal U.S. interference. Here is what the Kurds heard: When this is all over, we have to act in what are our larger national interests. We both want to defeat ISIS, but once that it done, we will again focus on the major American national security threats in the region - Russia and Iran. For that, we need Turkey more than we need you. We will try to help where we can, but our interests do not include you. Again, the Kurds are left standing alone. * Although the ambassador made his remarks in English, those remarks were translated into Arabic and reported. The translation is not exact - my interpretation of the translation is what people in the Kurdish area of Syria are reading. I was saddened to hear of the passing of President George H.W. Bush tonight. I have always regarded him as a key leader in a time of questionable leadership from both parties in Washington. His conduct of the Persian Gulf War of 1990-1991 was one of the better chapters of post-World War II American history. A clear mission, a well-resourced military to execute it, and the confidence in his generals to get the job done. I was proud to be a part of it. I only met President Bush one time. In the fall of 1990, he requested from U.S. Central Command's General Norman Schwarzkopf a briefing on a plan to liberate Kuwait. 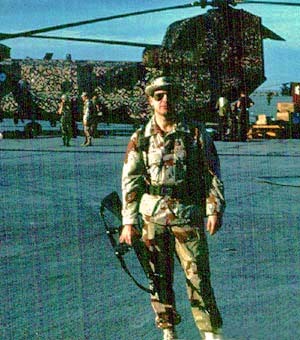 Prior to this, the mission of the American force deployed to the Persian Gulf was the defense of key ally Saudi Arabia. Now the goal posts had been shifted to eject Iraqi forces from what they regarded as part of Iraq. I was part of the briefing team sent to Washington to brief the senior military leaders on the plan. As we prepared to leave Riyadh for Washington, General Schwarzkopf admonished the four team members that we were going to Washington to present his proposal and his analysis, and that none of us were to offer our own opinions. Actually, his tone was a bit more strident, but I will just let it go at that. This is an except from Chapter 5 of my book, Ally to Adversary-An Eyewitness Account of Iraq's Fall from Grace (Naval Institute Press, 1991). You can pick up a used copy on Amazon for $2.00. We waited in the briefing room while Secretary of State James Baker, National Security Advisor Brent Scowcroft, his deputy Bob Gates, White House Chief of Staff John Sununu, and Vice President Dan Quayle gathered and traded good-natured jibes. Cheney explained that General Powell had brought a briefing team from CENTCOM headquarters in Riyadh representing General Schwarzkopf. Bush nodded at Powell and walked over to the team standing in the rear of the crowded room. Powell introduced us to the president and told him that I would begin the briefing with the intelligence picture. My portion of the briefing was to set the stage for the presentation of the air campaign and ground-battle plans. It was the least controversial presentation and thus should draw the fewest questions. Easy, I thought. After all, I had successfully briefed a much tougher audience in the tank the day before—the country’s five senior general officers (including the chief of my parent service) made for a much more nerve-wracking experience. No sooner had I started than an aide came in and whispered something to the president, after which he excused himself for a few minutes. When he returned, he appeared to be a bit distracted and apologized, explaining that he had been on the telephone to French president Mitterand. As he turned his attention back to the briefing, I described in detail the construction of the Iraqi defensive lines. When I moved on to the next topic, which was Iraqi command and control of forces in the region, Bush stopped me and asked me to repeat the description of the Iraqi defenses. In the ensuing questions and answers with the president (his questions, my answers), I mentioned that I had been in Iraqi trenches and defensive positions around al-Basrah during the Iran-Iraq War. Bush looked inquiringly at Cheney and Powell. Cheney shook his head as if to say, “Don’t pursue this, Mr. President.” It appeared that the military cooperation with Iraq that had seemed such a good idea in 1987 and 1988 might come back to haunt us politically. At the completion of my portion of the briefing, I asked the president if there were any additional questions. He asked about morale of the Iraqi troops in Kuwait. I said that all our indications were that morale was low, but this was based on interrogations of the very few deserters available at that time. He asked if, based on my experience with the Iraqis, it was my opinion that they would fight. Remembering the admonishment from General Schwarzkopf about voicing personal opinions, and the fact that our plans were based on the CENTCOM assumption that the Iraqis would fight if attacked, I hesitated. General Powell, aware of Schwarzkopf’s proscription on giving our personal opinions, sensed my predicament. In a gesture that I will always appreciate, Powell leaned forward into my line of sight and nodded. I told the president that based on what I had seen in the defense of Al-Basrah in 1987, the Iraqis would probably not fight hard to defend Kuwait from a coalition attack. However, once we had pressed the attack into Iraq, we should plan for stiff resistance, especially if we approached the major population center of Al-Basrah. President Bush nodded and thanked me, and I sat down. It was a pretty heady moment for an Air Force major. The President was gracious and appeared to actually listen to what I had to say. I will always remember him fondly. Since you asked: How do you pronounce the name Khashoggi? The murder of U.S.-based political columnist Jamal Khashoggi continues to dominate the news cycle. We have all heard reporters, analysts, and pundits providing their comments using a variety of pronunciations of the name Khashoggi. The Khashoggi family became prominent in Saudi Arabia in the early 20th Century. For practical purposes, I suggest we all use the commonly accepted Western pronunciation of Jamal Khashoggi, kha-SHOW-gee. - Jamal’s uncle was high-profile Saudi arms dealer Adnan Khashoggi (‘Adnan Khashuqji), known for his part in the Iran–Contra scandal, and was one of the richest men in the world at the time. - Jamal was also a first cousin of Dodi Fayed (Dudi al-Fayid), who was dating Diana, Princess of Wales, when the two were killed in a car crash in Paris. - Jamal’s grandfather, Muhammad Khashoggi (Muhammad Khashuqji), was the personal physician to King ‘Abd al-’Aziz Al Sa’ud, founder of the Kingdom of Saudi Arabia. Following the accidental shootdown of a Russian Air Force IL-20M (NATO: Coot-A) electronic intelligence aircraft last week, Russia announced that it is deploying at least one S-300 air defense missile system to Syria to bolster Syria's air defenses. It was a Syrian air defense S-200 (NATO: SA-5 Gammon) missile that downed the Russian reconnaissance plane, killing all 15 on board. Syrian air defenses have been plagued with not only maintenance issues due to the seven-year civil war, but poor training and leadership. Russian Federation Minister of Foreign Affairs Sergey Lavrov announced that the delivery of the air defense system has already started. In fact, in the last few days, at least three Russian Air Force AN-124 (NATO: Condor) heavy transport aircraft have flown from Russian air bases to Humaymim air base, Syrian, a base now used almost exclusively for Russian forces. 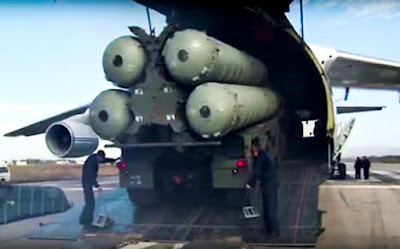 While other Russian military transport aircraft fly daily resupply flights, the size of the S-300 system components require the use of the jumbo Condor airlifters. It is still unknown which version of the S-300 system will be delivered to Syria. 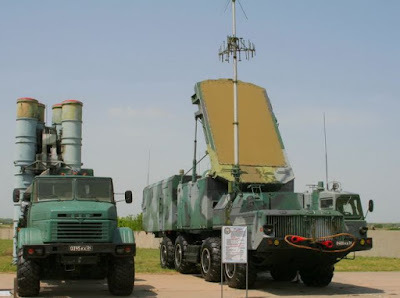 Versions of the S-300 family of air defense missiles have been in use by Russian and other militaries for decades - the initial deployment of the original S-300P (NATO: SA-10 Grumble) was in 1978. An anti-ballistic missile capability (the S-300V) was added in 1983. 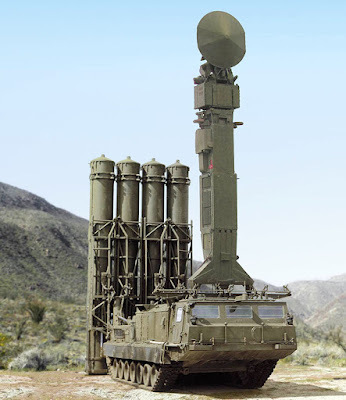 The Russians developed an export version in the early 1990's - the S-300PMU-1 (NATO: SA-20A Gargoyle) with a range of 75 miles, followed shortly thereafter with the extended range (120 miles) S-300PMU-2 (US designation SA-20B). 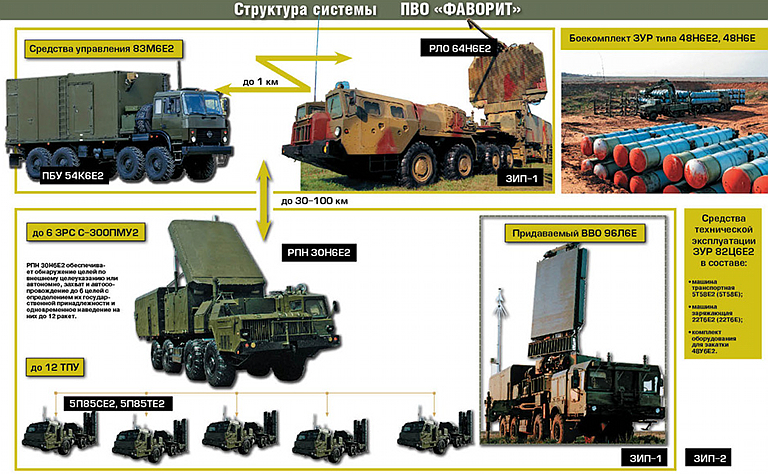 Since 1996, the primary export version has been the 120-mile range S-300VM "Antey-2500" (NATO: SA-23 Gladiator/Giant). I suspect the SA-23 is the version that will be supplied to the Syrians. It is the same system sold to Egypt in the wake of the ill-advised U.S. arms embargo after the military coup of 2014 led by then-General (now President) 'Abd al-Fatah al-Sisi. I want to preface some of the more technical details of the SA-23 with a few comments about Russian air defense systems. The Russians have always emphasized development of air defense systems - it fits into their military strategy, just as the United States tends to emphasize offensive systems. Russian air defense systems are state of the art and highly capable. Although the Russians have developed even more advanced systems than the S-300VM, such as the S-400 and S-500 systems, the S-300VM system to be provided to the Syrians will pose a serious threat to almost all aircraft in the region, with the exception of fifth generation U.S. Air Force F-22 Raptor and Israeli Air Force F-35I Adir stealth fighters. The Antey-2500 system consists of a command post vehicle, three general surveillance radars, a sector surveillance radar, and a guidance radar. These electronics support/control up to six missile radar-equipped transporter-erector-launchers (TELAR), and six loader-launcher vehicles. It is a large, but completely land mobile system. It was the first system in the world capable of simultaneously engaging aircraft, cruise missiles, and ballistic missiles. The Russians claim that it can successfully track low radar cross section aircraft (stealth) aircraft at ranges over 100 miles. The Russian Ministry of Defense said they would deploy two S-300 battalions to Syria. That means about 24 launchers. 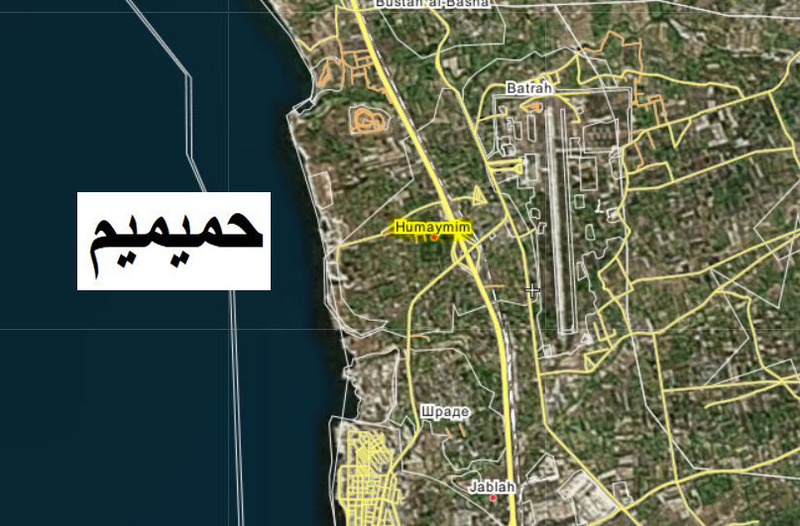 Since late 2016, the Russians have operated S-300 and S-400 missile systems in Syria around the air base at Humaymim and their naval facility at Tartus. Although these systems have been noted active electronically, they have yet to engage either Israeli or U.S.-led coalition aircraft. 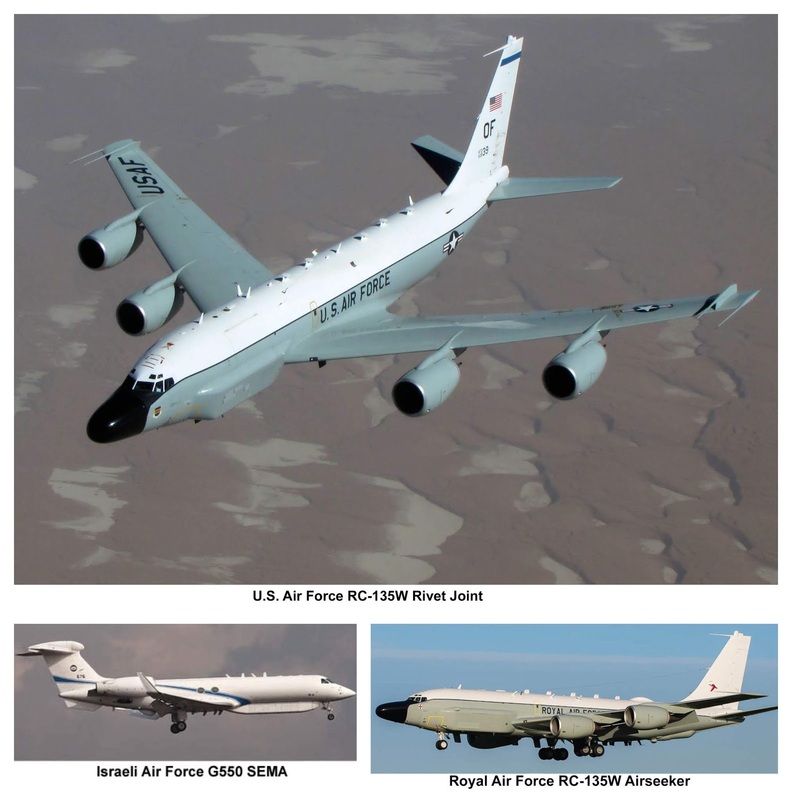 The Russians and Israelis have established deconfliction protocols to avoid engagements when Israeli aircraft conduct operations against Iranian targets in Syria. It is an uneasy arrangement - it is in question now that rather incompetent Syrian air defense units downed the Russian reconnaissance aircraft. It is unknown where the Syrians will deploy their new air defense capability. In the past, Syrian air defenses have been concentrated in the southern part of the country in an attempt to defend Damascus. However, the recent spate of Israeli attacks have been against Iranian targets across the country, ranging from the Damascus suburbs to the central deserts and the northwest coastal area. Remember that it is not the range of the S-300MV/Antey-2500 that is the threat, it is the capability. The existing S-200 missiles in the Syrian inventory have a longer range (190 miles versus 120 miles), but it is the lethality of the S-300 system and its ability to operate in a dense electronic warfare environment. It remains to be seen just how the Syrians will integrate the new system into the existing Syrian air defense network, and if the S-300VM will significantly raise the threat to Israeli and U.S.-led coalition aircraft. It is also unknown what Russian support will be provided. Since Syria had contracted in the past to purchase the S-300 system, a deal that has been on hold, they do have a small cadre of officers trained in the system. I suspect the Russians will provide on-site trainers and advisers as part of the deployment to prevent another deadly and embarrassing incident. In any case, the introduction of yet another capable Russian weapons system into Syria increases the likelihood of continued confrontation between Syrian and Israeli forces, and increases the risk of a direct U.S.-Syria confrontation. ADDENDUM: Iranian Air Force or SAHA airlines - who really owns this aircraft? 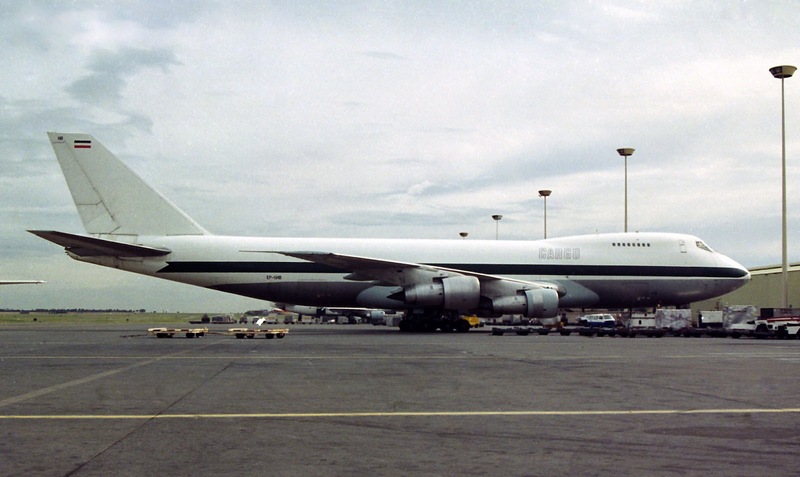 ADDENDUM: In light of the September 15 Israeli airstrike on the cargo associated with this particular aircraft, I wanted to update this article with new information and photographs. The new information appears immediately following the original article. 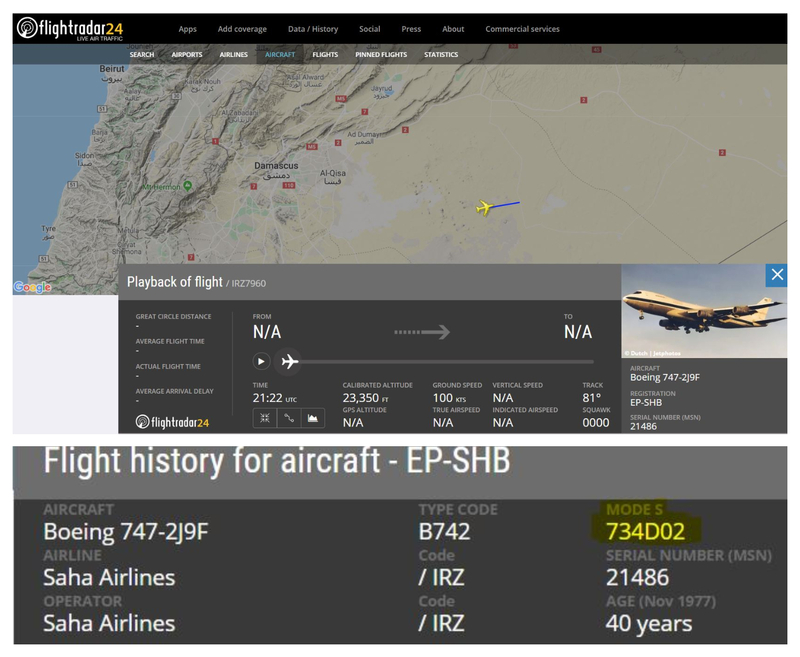 Hard-to-catch track of this Iranian Boeing 747-200 freighter aircraft over Syria, here as civil registration EP-SHB. Note the Mode S (Hex) code 734D02 – this stays with the aircraft as it changes registration and owners. The Mode S and registration seem to agree on SAHA airlines. This particular aircraft was delivered to the Imperial Iranian Air Force in 1977 as 5-8113. For 1984 and 1985, it was leased to then national civil flag carrier Iran Air, and then returned to the Islamic Republic of Iran Air Force (IRIAF). 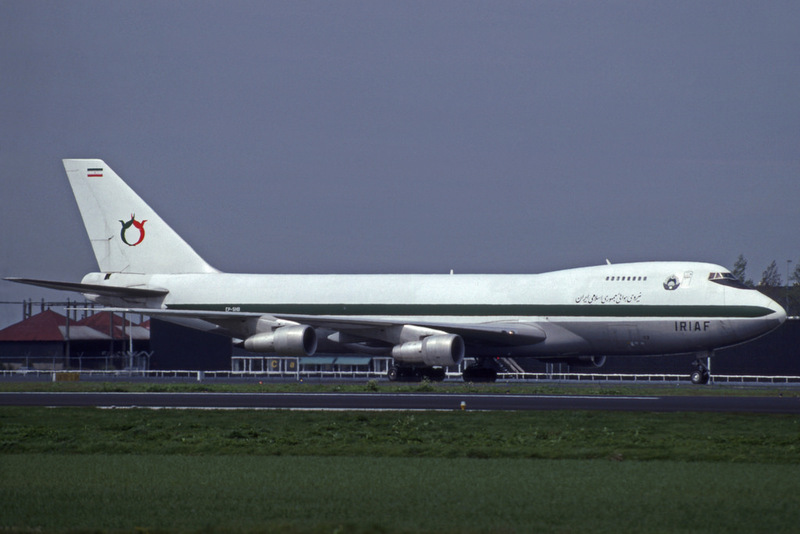 In 1991, it was “leased” to SAHA airlines, a wholly-owned company of the IRIAF. In the intelligence business, we call this a shell company. In 2013, SAHA airlines suspended all operations, restarting again in 2017. 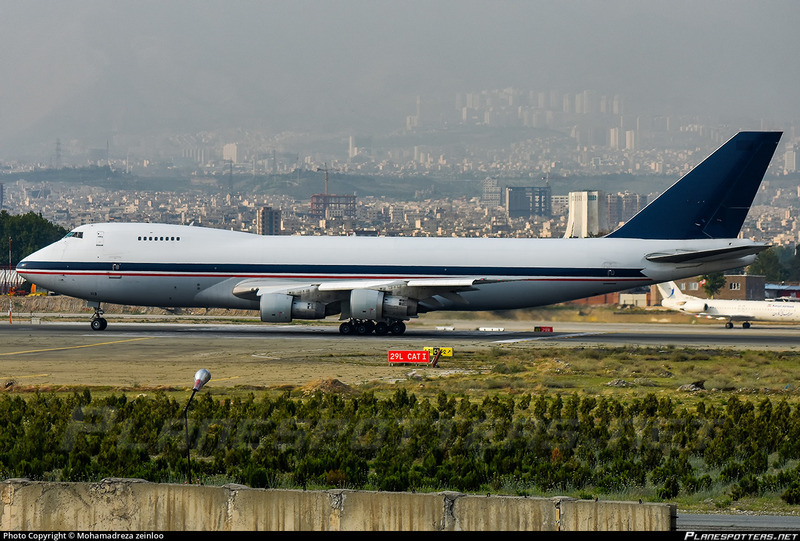 At that time, EP-SHB was returned to the IRIAF, again as 5-8113. 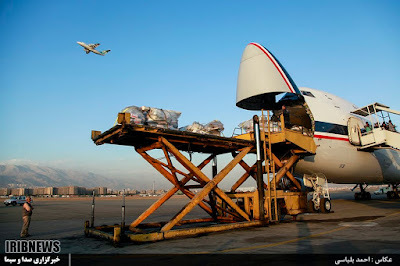 It appears to be in IRIAF service today, operating from Tehran/Mehrabad airport – home to the Islamic Revolutionary Guard Corps (IRGC) aircraft fleet. How coincidental. I first saw this aircraft in Syria in this livery. Note the Iranian flag on the tail, over the military airlift service logo, plus the IRIAF identification in Farsi on the front of the fuselage and IRIAF in Latin letters below. No question that this was an Iranian air force jet. 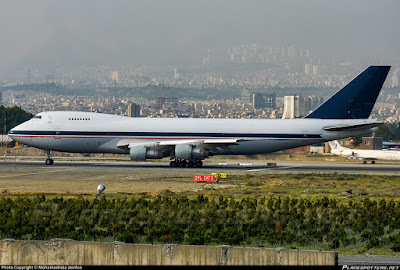 As Iranian support for terrorist groups became notorious, we saw the aircraft in this livery. Note the removal of the IRIAF identification in Farsi and the IRIAF letters. The flag and logo remained. Iranian, but whose? The logo alone tells me it's still IRIAF. As Iran promoted the fiction that this and other aircraft were not part of the the Iranian air force or involved in support to terrorist groups - notably Hizballah - the military airlift service logo was removed, and the civilian registration EP-SHB was applied. This is the 2018 livery of the aircraft. This is what we in the intelligence business call a “vanilla” airplane. Although in the color scheme of the IRIAF, there is no visible identification – it’s likely there, but so small it is virtually undetectable from more than 10 feet. Who really owns this aircraft? Spoiler: That was a rhetorical question. We know. ADDENDUM: Updated information begins here. This image is a screen shot from the Islamic Republic of Iran Broadcasting network showing this same aircraft. As I indicated above, its identification is there, but very small and not very descriptive. Note the numbers 113 on the lower fuselage. That is an abbreviated form of the IRIAF registration 5-8113. If you look closely at the earlier photograph in the original article, and now know where to look, you can make out the 113. This image is likely at the military ramp at Tehran's Mehrabad airport. 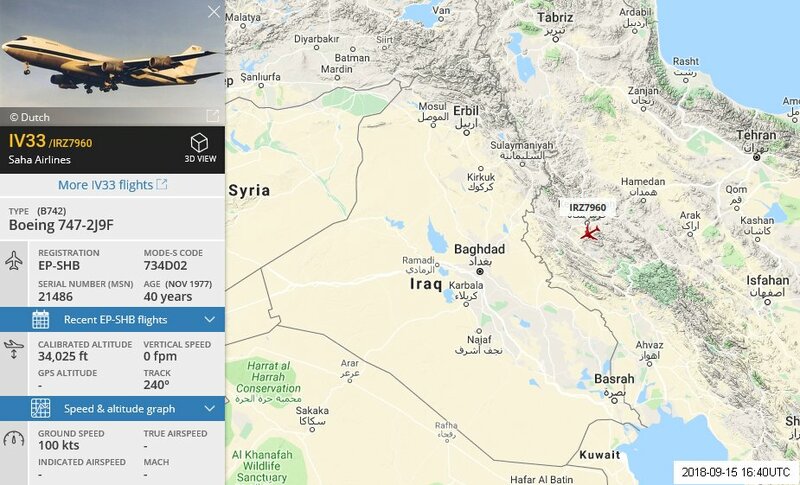 This image shows this IRIAF aircraft, using its false civilian registration EP-SHB en route from Tehran to Damascus on the evening of Saturday, July 15. It landed later at the Syrian Air Force 29th Air Brigade ramp at Damascus International Airport. 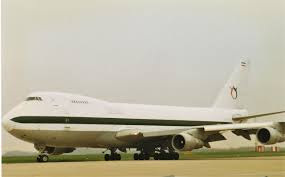 After the cargo was unloaded Saturday night, it was struck by Israeli Air Force missiles, destroying the cargo, and likely damaging the aircraft. The image above, posted in a tweet from an imagery analyst, shows the aircraft on the military ramp with blackened tarmac where the cargo was struck.